With just a few weeks until Easter, the shelves are filled with chicks, ducks and Easter grass! 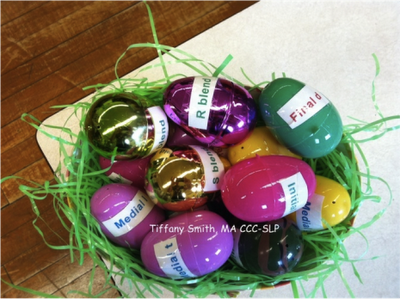 My friend Tiffany Smith, MA CCC-SLP is sharing a fun activity with us today! Tiffany is fellow Ohio University Bobcat (you might have seen us in the Sweet 16!) and now lives in Charleston, WV. 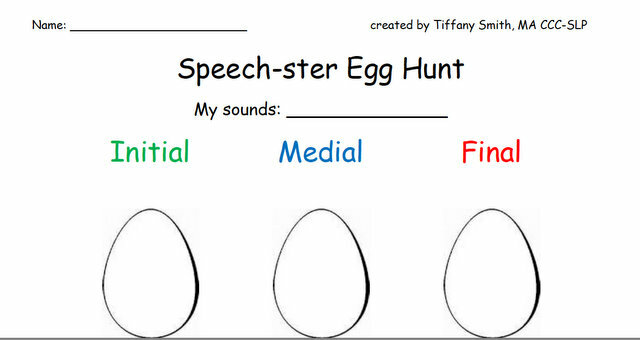 Since spring break and Easter are approaching quickly, we are having Speech-ster Egg Hunts during therapy. The goal for the students is to find the eggs with their targets on them and make up words that correspond with their target sounds or language goals. 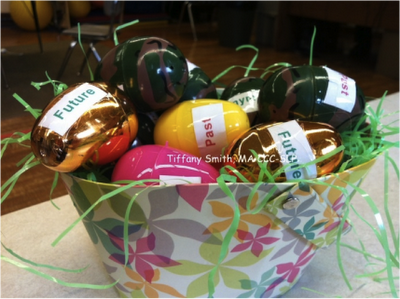 I created Easter eggs that have articulation and language targets on them. The labels listed initial, medial, and final [target sound] as well as past, present, future; antonym, synonym; and rhymes with. I color coded the labels so that my students who recognize their target letters can determine the sound placement even if they cannot read the words initial, medial, and final. I put stickers in the eggs as well as a reward for participating. I hid the eggs around my room and gave the students several minutes to find them. I varied the time based upon the grade level and number of students. Students collected eggs with their targets in baskets and brought them to the table. Each student was given a printable and a pencil (or for the younger students, I wrote their answer). They took turns thinking of spring-related target words with their target sounds or language goals. If they could not think of one, we brainstormed as a group. Next they put each word into an Easter or spring related sentence. After they completed a sentence, the students were able to open up an egg to see if there was a prize inside. After we completed the worksheet, the students re-hid their eggs so they were ready for the next group and put the worksheet in their speech folder. 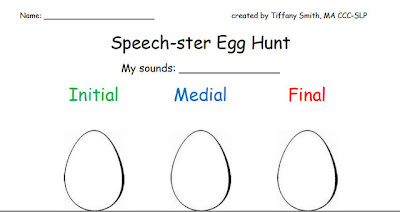 Egg Hunt Synonym Worksheet Egg Hunt Verbs Worksheet Egg Hunt Artic Worksheet Egg Hunt Labels 1 Egg Hunt Labels 2 Such a great idea to use labels Tiffany! I know the kids will enjoy getting up and moving while their working on their skills with this activity! Thanks for sharing! Love this! Thank you to Tiffany! I printed out the verb tense worksheet and synonym/antonym and can’t wait to use. Can’t seem to get the artic page, it keeps pulling up the verbs. Don’t stop with the great ideas! Ooo Thanks Phoebe! I re-linked it. Should be good now! Enjoy! All your activities are fun, Jenna! Nice to be creative again–after so many years of doing this, it’s so great to have these fingertip ideas (and some recycled ones from my distant past! )Mahalo nui again! I used this for my language kids and artic and it was a lot more entertaining than the average day, thanks to you! Instead of distinguishing the different targets by label, I just had the kids look for a particular colored egg hidden around the room in which I’d placed their particular sound of language target.